The big jolly man in red is on his way to Victoria's capital city. 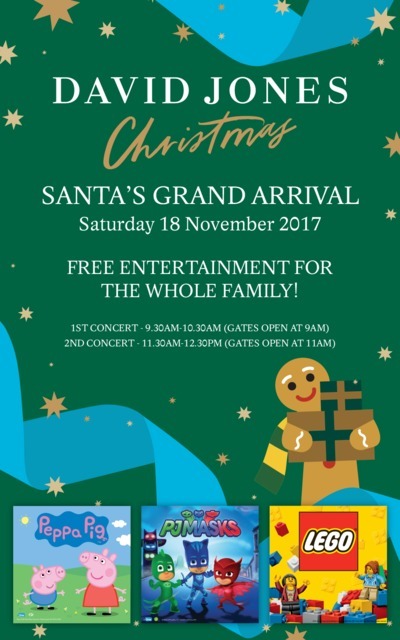 Catch him at the City of Melbourne's official 'Santa's Grand Arrival' event at Bourke Street Mall on Saturday 18 November. The day begins at 9:30am and ends at 12:30pm with a morning of free entertainment for the family. This year the festivities will include live entertainment from new favourites PJ Masks as well as Peppa Pig and of course Santa himself! Don't miss your chance to enjoy this all-singing and dancing Christmas extravaganza live on stage. To keep little fingers busy, there's a chance to enjoy playtime in the LEGO Play Zone before and after the show. Presented by David Jones and proudly sponsored by the City of Melbourne. BYO picnic blanket, drink bottle, hat and sunscreen to protect you from the sun as it's forecast to be a bright and sunny day.